Heat the oven to 350°F. Beat 1 egg and the water in a small bowl with a fork. Brush the pastry shells with the egg mixture. Grate the zest from 1 lime. Beat the condensed milk, remaining egg, egg yolk, Key lime juice and lime zest in a medium bowl. Pour the mixture into the pastry shells. Bake for 15 minutes or until the filling is set. Let the tarts cool on the baking sheet for 15 minutes. Cut 6 thin slices from the remaining lime. 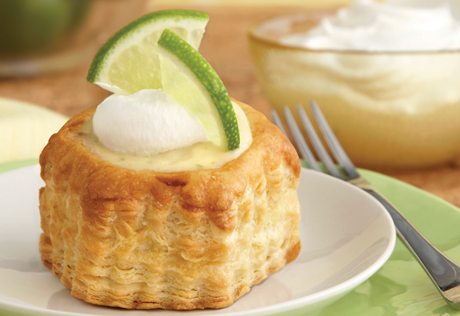 Top each tart with 1 tablespoon whipped topping and 1 lime slice.